“Our goal was to construct a house with the lowest possible budget, while ensuring comfort and efficiency for the residents inside,” says Sergey Kolchin, founder of Le Atelier. The architects accented the home’s front door by painting it yellow, harmonizing the structure with the surrounding forest. Placed throughout the home’s slatted wood exterior, windows are positioned to allow for the most attractive views and ample natural light. The sloped roof design was chosen for its minimal cost, and for its ability to redirect snow away from a neighboring residence. A pair of lights from IKEA hang above the first floor, which houses the living room, kitchen, and bathroom. Pine floors, painted black, run throughout the residence. Chairs and lights from IKEA accompany a custom dining table, which incorporates shelving and storage space underneath. Like the nearby dining room wall, this custom-made wood storage space was painted white then enhanced with a geometric pattern, drawn on with black felt-tip pens. Cabinet handles from Leroy Merlin complement the graphic design. Inspired by “polati,” a sleeping loft that featured prominently in traditional Russian homes, Le Atelier created a series of tiny bedrooms that connect to a playroom with a study upstairs. A clock and lights from IKEA blend into the room’s simple color palette. The pared-down aesthetic of the children’s bedrooms lets their chartreuse walls pop. Near custom pine shelving on the third floor, folding chairs and a table from IKEA provide a tranquil space for studying. 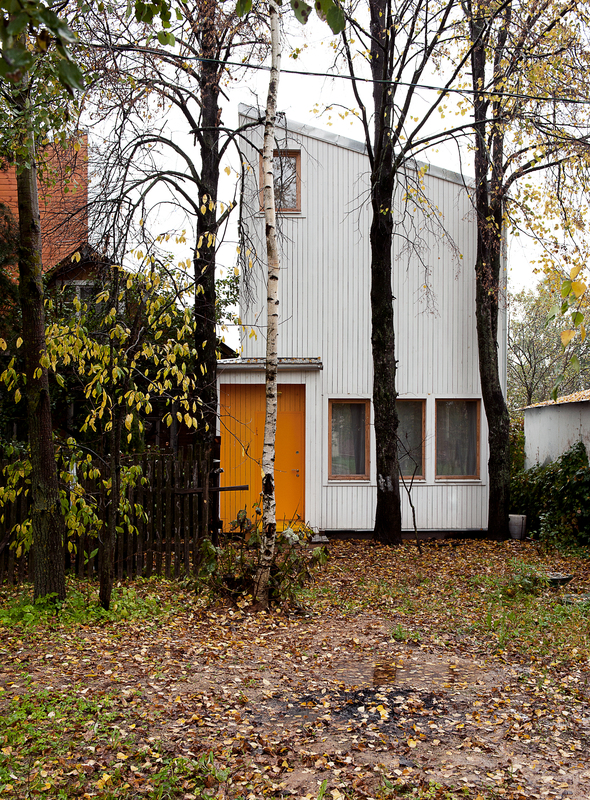 Russian firm Le Atelier was approached by a family of five with three small children to construct a home on their 484-square-foot property in Moscow. With just $7,000 to build, finish, and furnish the house, the undertaking required both strategy and imagination. “Our challenge was finding a balance between different functions inside the house, and how much room was needed for each,” architect Sergey Kolchin says. His team designed a simple rectangular volume with a one-sided, sharply sloped roof. Windows placed throughout the three-floor structure offer exquisite views and natural light. Inside, a yellow entryway opens up into a kitchen, living room, and bathroom. Goose-step stairs—steps with a distinctive tread shape that’s ideal for compact spaces—lead to the master bedroom and bi-level kids’ room, the largest part of the home. Nearly all of the furnishings are built-in. By making them part of the construction process, the architects cut costs and customized ways of maximizing space.